Warfare for Writers - Officers covers commissioned and non-commissioned officers, different from the days when one could buy a rank. From a Timons Esaias lecture. 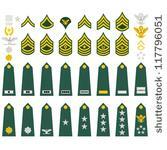 Non-commissioned officers - sergeants and corporals and rarely sergeant-majors - are the foreman of the military. 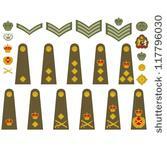 Commissioned officers lead companies, or their equivalent, and up. Officers are the quarterbacks of the team, they tell everybody else what to do and are responsible if they don't get it done. If officers work well together, they combine their strengths. If they squabble, they make their weaknesses prominent. Think plot conflicts! An overwhelming concern for officers in most armies in history, is seniority. Armies, since ancient Rome, have had strict rules on who gets what job based on seniority down to minutes and seconds. If a higher ranking officer shows up, based on seniority, even in the middle of a battle, he assumes command and he can change the battle orders. If your character is an officer in a civilized military, this needs to be on their mind. If your character is a knight in a feudal military, then he is concerned about honor and precedence becoming more important, more complex, and more vexing. Confusion for writers - in addition to names and official ranks there are positions and brevets. 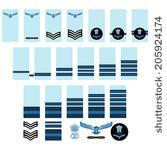 Positions are the jobs officers do, adding meanings to their rank with titles such as: executive officer, quartermaster, master, commander, first mate, officer of the day, and so on. Brevets or field commissions are acting ranks usually awarded doing wartime, giving the power of the rank without postwar privileges and pensions. The one absolute SIN of an officer in the field, if he commands a unit, is not to reconnoiter his position. (Which is, to find out where other units are, and the nature of the surrounding terrain.) This sin is all too common and is utterly inexcusable!